Azure Cosmos DB is Microsoft’s globally distributed multi-model database service. You can use Azure Cosmos DB to quickly create and query key/value databases, document databases, and graph databases, all of which benefit from the global distribution and horizontal scale capabilities at the core of Azure Cosmos DB. 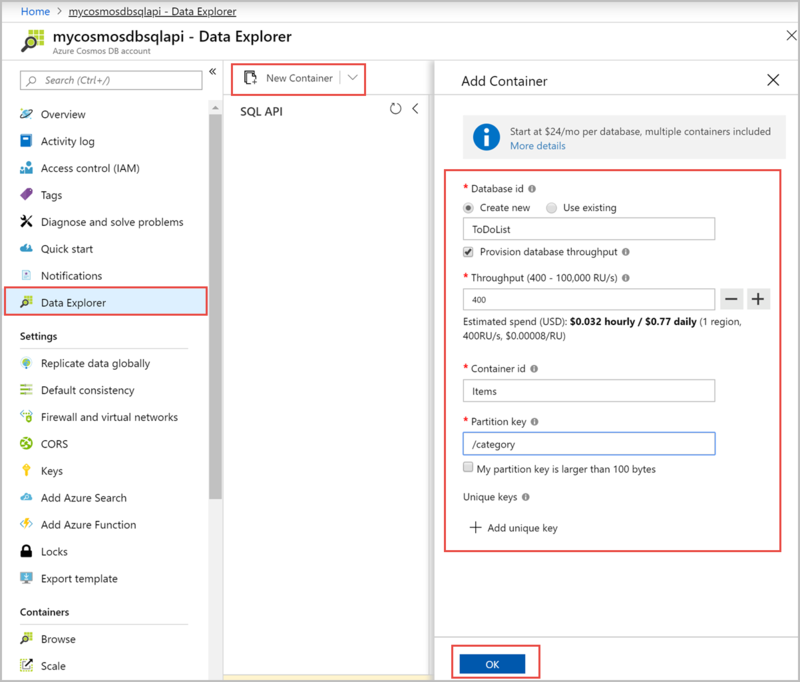 This quickstart demonstrates how to use the Azure portal to create an Azure Cosmos DB SQL API account, create a document database and collection, and add data to the collection. You then use a SQL .NET SDK web app to add more data to the collection. In this quickstart, you use Data Explorer in the Azure portal to create the database and collection. You can also create the database and collection by using the .NET sample code. To learn more, see Review the .NET code. You can download and use the free Visual Studio 2017 Community Edition. Make sure that you enable Azure development during the Visual Studio setup. You can Try Azure Cosmos DB for free without an Azure subscription, free of charge and commitments. Or, you can use the Azure Cosmos DB Emulator with a URI of https://localhost:8081. The Primary Key is provided in Authenticating requests. Select Create a resource > Databases > Azure Cosmos DB. 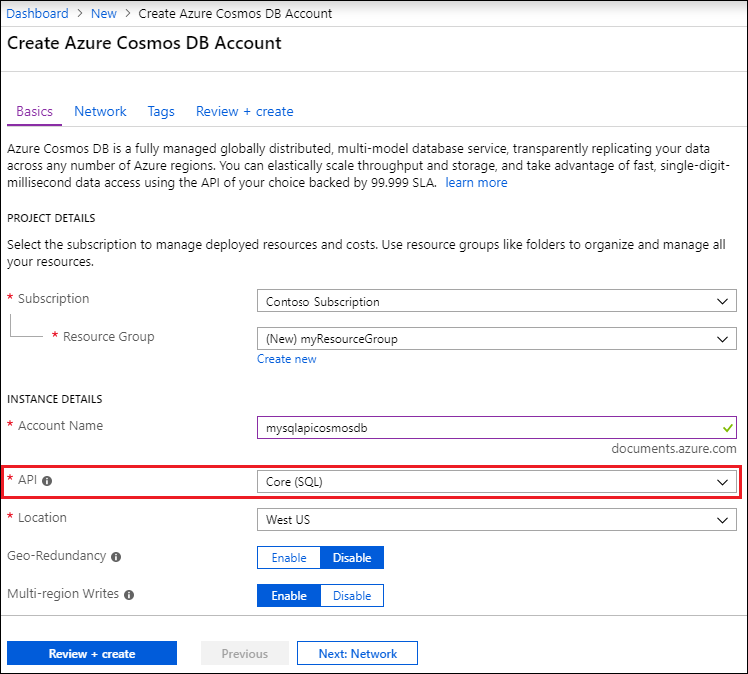 On the Create Azure Cosmos DB Account page, enter the basic settings for the new Azure Cosmos account. Subscription Subscription name Select the Azure subscription that you want to use for this Azure Cosmos account. Resource Group Resource group name Select a resource group, or select Create new, then enter a unique name for the new resource group. Account Name Enter a unique name Enter a name to identify your Azure Cosmos account. Because documents.azure.com is appended to the ID that you provide to create your URI, use a unique ID. The ID can only contain lowercase letters, numbers, and the hyphen (-) character. It must be between 3-31 characters in length. API Core (SQL) The API determines the type of account to create. 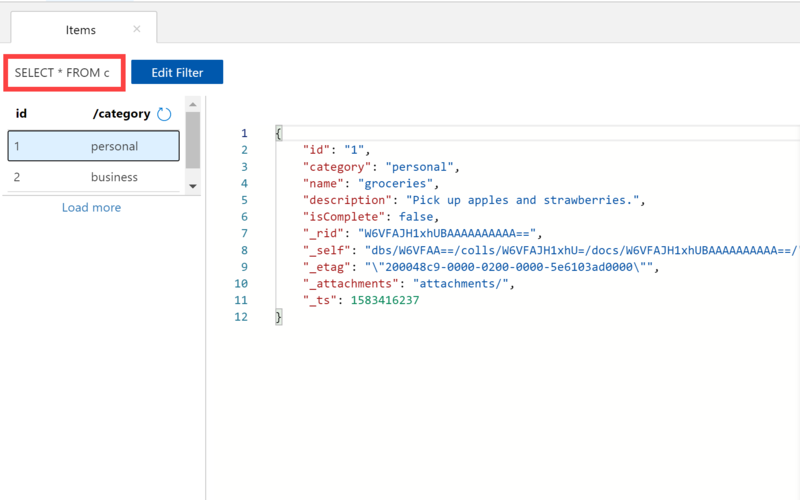 Azure Cosmos DB provides five APIs: Core (SQL) and MongoDB for document data, Gremlin for graph data, Azure Table, and Cassandra. Currently, you must create a separate account for each API. Select Core (SQL) to create a document database and query by using SQL syntax. Learn more about the SQL API. Location Select the region closest to your users Select a geographic location to host your Azure Cosmos DB account. Use the location that is closest to your users to give them the fastest access to the data. Select Review + create. You can skip the Network and Tags sections. Review the account settings, and then select Create. It takes a few minutes to create the account. Wait for the portal page to display Your deployment is complete. Select Go to resource to go to the Azure Cosmos DB account page. You can use the Data Explorer in the Azure portal to create a database and collection. Select Data Explorer from the left navigation on your Azure Cosmos DB account page, and then select New Collection. You may need to scroll right to see the Add Collection area. In the Add collection page, enter the settings for the new collection. Database id ToDoList Enter ToDoList as the name for the new database. Database names must contain from 1 through 255 characters, and they cannot contain /, \\, #, ?, or a trailing space. Collection id Items Enter Items as the name for your new collection. Collection IDs have the same character requirements as database names. Partition key /category The sample described in this article uses /category as the partition key. Throughput 400 Leave the throughput at 400 request units per second (RU/s). If you want to reduce latency, you can scale up the throughput later. Don't add Unique keys for this example. Unique keys let you add a layer of data integrity to the database by ensuring the uniqueness of one or more values per partition key. For more information, see Unique keys in Azure Cosmos DB. Select OK. Data Explorer displays the new database and collection. Add data to your new database using Data Explorer. In Data Explorer, the new database appears in the Collections pane. Expand the ToDoList database, expand the Items collection, select Documents, and then select New Document. Select New Document again, and create and save another document with a unique id, and any other properties and values you want. Your documents can have any structure, because Azure Cosmos DB doesn't impose any schema on your data. 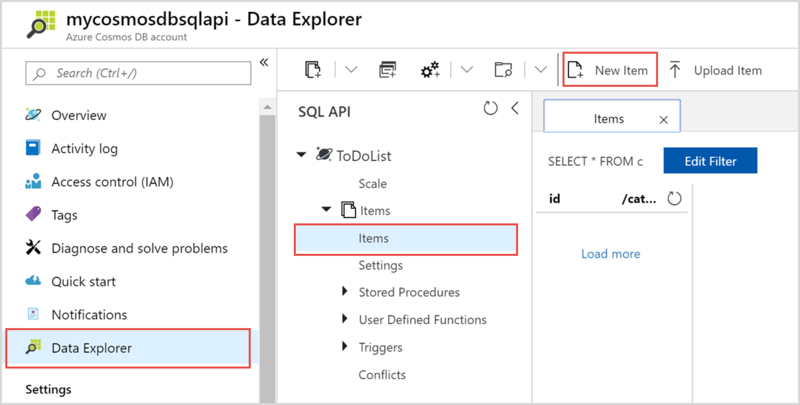 You can use queries in Data Explorer to retrieve and filter your data. At the top of the Documents tab in Data Explorer, review the default query SELECT * FROM c. This query retrieves and displays all documents in the collection in ID order. To change the query, select Edit Filter, replace the default query with ORDER BY c._ts DESC, and then select Apply Filter. The modified query displays the documents in descending order based on their time stamp, so now your second document is listed first. If you're familiar with SQL syntax, you can enter any supported SQL queries in the query predicate box. You can also use Data Explorer to create stored procedures, UDFs, and triggers for server-side business logic. Data Explorer provides easy Azure portal access to all of the built-in programmatic data access features available in the APIs. You also use the portal to scale throughput, get keys and connection strings, and review metrics and SLAs for your Azure Cosmos DB account. 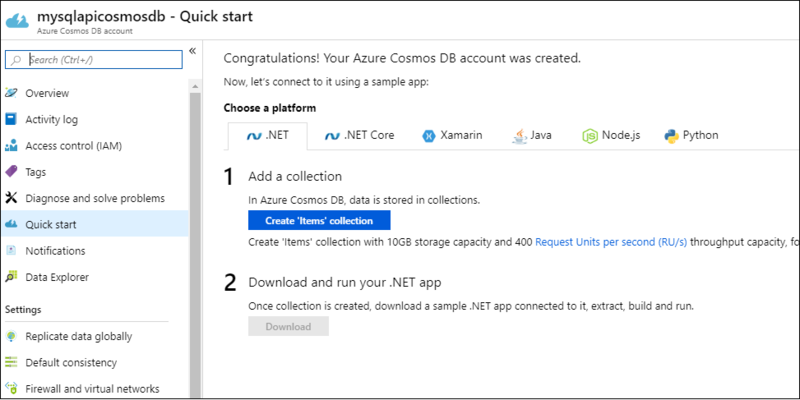 To see how easy it is to work with your Azure Cosmos DB data programmatically, clone the sample SQL API .NET web app from GitHub, update the connection string, and run the app to update your data. You could also create the database and collection by using the .NET sample code. To learn more, see Review the .NET code. First, clone a C# SQL API app from GitHub. Navigate to and open the todo.sln file of your cloned app in Visual Studio. In Visual Studio Solution Explorer, open the web.config file. Go back to the Azure portal to copy your connection string information to paste into the web.config. 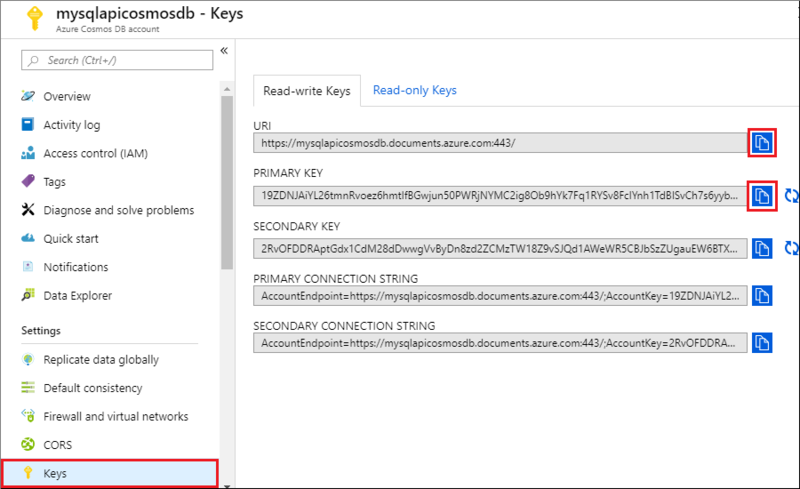 In your Azure Cosmos DB account left navigation, select Keys. Make sure the database and collection values in the web.config match the names you created earlier. Save the web.config. You've now updated your app with all the information it needs to communicate with Azure Cosmos DB. In Visual Studio, right-click the todo project in Solution Explorer, and then select Manage NuGet Packages. In the NuGet Browse box, type DocumentDB. From the results, install the Microsoft.Azure.DocumentDB library if not already installed. This installs the Microsoft.Azure.DocumentDB package and all dependencies. If the NuGet Package Manager displays a message that some packages are missing from the solution, select Restore to install them from internal sources. Select Ctrl+F5 to run the app in your browser. Select Create New in the to-do app, and create a few new tasks. You can go back to Data Explorer in the Azure portal to see, query, modify, and work with your new data. This step is optional. In this quickstart, you created a database and a collection in the Azure portal and added sample data by using the .NET sample. However, you can also create the database and the collection by using the .NET sample. Review the following snippets if you're interested in how database resources are created in the code. The snippets are all taken from the DocumentDBRepository.cs file in the todo project. 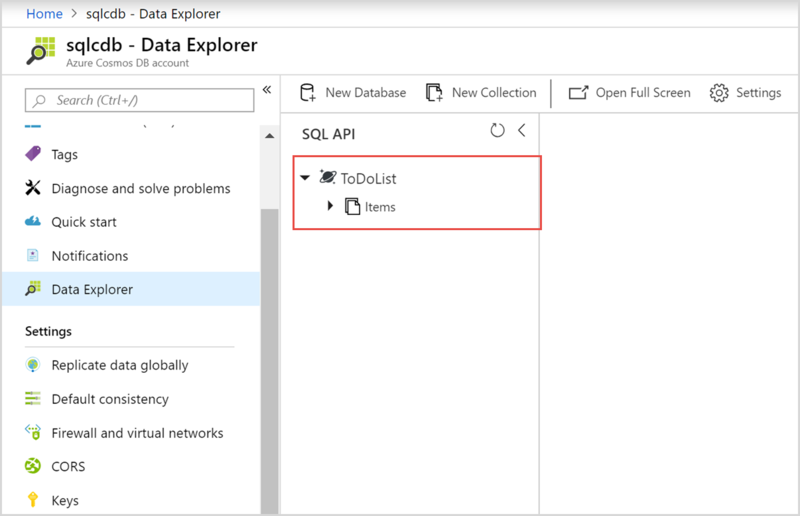 In this quickstart, you learned how to create an Azure Cosmos DB account, create a database and collection using the Data Explorer, and run a .NET web app to update your data. 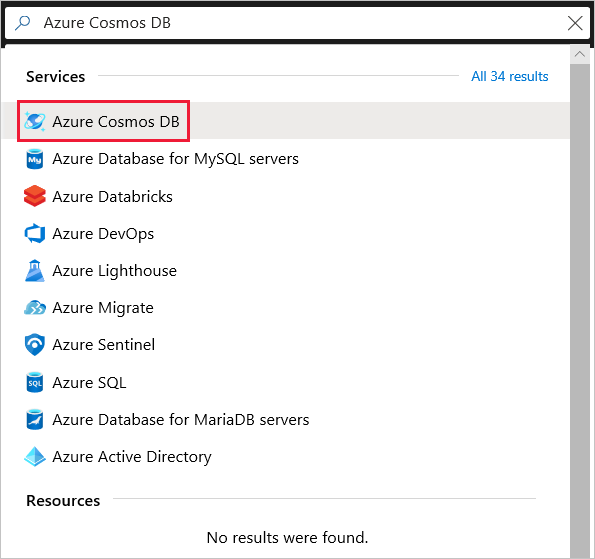 You can now import additional data to your Azure Cosmos DB account.